My recent window shopping trips have put 1950’s and vintage décor on my mind. I’ve mentioned before that in our next house I hope to have a 50’s inspired eat-in kitchen area. We’re not moving any time soon, so I decided to create a vintage lounge mood board to channel my vision. For more ideas and inspiration, I headed to one of my favorite diners ~ Galaxy Diner, located in the heart of Carytown. 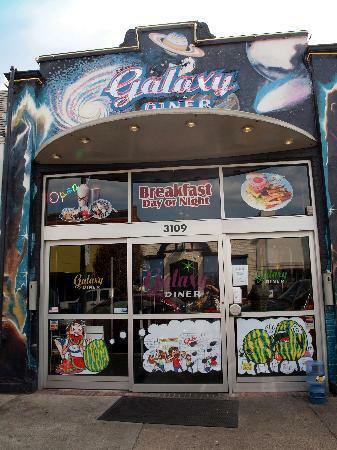 Galaxy Diner serves classic diner food with a ‘cosmic twist’. Try the ‘Knock me up Scotty’ (fried pickles and ranch dressing with a hardboiled egg and a side of ice cream), the ‘Big Dipper Double Burger’, or my personal favorite – the ‘Black Hole Pancakes’ (pancakes with an Oreo center). The décor inside the diner is a perfect match for their name and menu items. When you enter the restaurant, the comet-like pendant lights are the first thing you see. They immediately provide the fun and funky vibe that is echoed throughout the restaurant. Once your eyes travel back down to earth level, you’ll notice their diner bar stools. They’re covered in sparkly red and silver vinyl and create the perfect spot for a hearty breakfast or a late night drink with a friend. If a booth is more your style, they have plenty of those as well. The same red and silver vinyl is used, and a swirly design on the table tops makes me think of outer space. 1. I started by finding these sparkly red pendant lights from Lumens.com ($300). When the light is turned on, the bubbles in the glass look like tiny little stars – perfect for my Galaxy Diner inspired room! 2. I covered one wall in the room with the gray, black, and white ‘Walldots’ wallpaper from One Stop Modern ($110 / roll) to serve as a feature wall and to be backdrop for the red pendant lights. A traditional printing technique is used to make the pattern appear as though it has been hand painted. 3. Every lounge needs a bar, so I chose this vintage cocktail bar from Metro Retro Furniture ($2900). The wood parquet pattern adds warmth to the room while staying with the retro theme. 4. A twist on the traditional bar stools, the Swizzle Bar Stools’ low profile keeps the bar from being blocked (red ~ $61, silver ~$75). I chose a red one and a silver one in honor of the alternating stools at Galaxy Diner. 5. & 6. No bar is complete without bar tools ($20) and Old Fashioned glasses ($52). Both of these are vintage pieces I found on Etsy.com, but you could easily find similar items at your local antique store. 7. To truly lounge in your lounge, you need comfortable seating. The grey Sutton loveseat ($460) in Renu leather is comfortable and durable, and provides the perfect spot to relax with friends. 8. Two Bradstreet Chairs ($303 / pair) add more seating for entertaining. With their clean lines and multi-colored stripes, they reflect the mid-century modern vibe. 9. Pillows are always easy items to mix and match. I loved the mod chain link pattern of the two Shape Up Retro Taffy Pillows ($55). On the loveseat, I continued with geometric prints and paired a square pattern ($21.95) with a playful owl ($10). 10. In order to carry the color red around the room, I choose the Red Sasquatch wool rug ($327). Keeping with the geometric theme, the chevron pattern provides an alternative to stripes. 11. Have you heard of CB2? CB2 is Crate & Barrel’s online sister store. They describe themselves as “affordable modern for apartment, loft, home.” I loved the round shape of their Reprouvé Coffee Table ($299). The white top keeps the piece feeling light and the wood details reflect the wood in the bar. 12. Another modern light fixture, the Robert Sonneman Floor Lamp ($595) is from a local store – Metro Modern – and adds another fun and funky feature to the space. 13. The Gathering is an original painting by artist Will Wieber ($700). The bold colors and shapes reflect his take on mid-century modern art. 14. If you splurged on the painting, save money with this DIY sunburst wall clock tutorial from HGTV. 15. Benjamin Moore’s Revere Pewter ~ HC-172 completes the space with a soft silvery grey backdrop. Funky light fixtures, a red and gray color scheme, and mod bar stools were my inspiration for this Galaxy Diner themed lounge. By adding warm wood tones and mixing and matching geometric patterns, the room comes together into a lounge that would stay hip for decades to come. º What is your favorite diner décor element? º Have you seen funky light fixtures in other restaurants? *Comment on this post with your answers to the questions for a chance to win a Galaxy Diner gift certificate valid for lunch or dinner for two. A big thank you to the team at Galaxy Diner for donating the gift certificate! *Congratulations to Emily ~ she was the winner of the Galaxy Diner gift certificate! Happy 4th of July ~ I hope everyone has a wonderful Independence Day! I’ve pulled together a few items from Etsy that would bring a bit of that patriotic feeling into your home all year long. Add a punch of color and playfulness to any room with one of these fireworks pieces of art. These fun fireworks pillows would look great on a deck or sun porch. From Fine Pillow Covers ($20). Keep warm in the winter with this red and blue quilt from Jenny M’s Quilts ($150). Lanterns are a great accessory and can be used inside or outside. At just $10 each, you could afford to purchase a few of them from Mr. Beasley’s. I fell in love with these cupcake stands from Whitney Smith Pottery ($38 each). They would be adorable as part of a tablescape for cupcakes, but would also work as candle holders. I think they’re just as cute by themselves too! º What’s your favorite part about Independence Day – the cookouts, the baseball, the fireworks? With Valentine’s Day is just around the corner, pinks and reds are popping up everywhere. Here are a few items that could be easily incorporated into your home’s décor. These festive accents are ones that you would continue to enjoy long after the chocolates are eaten and the flowers have wilted. For a subtle touch of red, try these red and white floral knobs from World Market. They would give new life to an old dresser, or be a fun surprise on a guest room night stand. This red ceramic owl bank from Kathy’s Klay Shop on Esty has such personality. He could be used as inspiration for a child to save some extra money, or on a mantel to bring a pop of color into the room. To make a much louder statement, try this red rose rug from Pier 1. In an otherwise neutral room, it would be a grand centerpiece. The petals of the rose give this rug an extra punch of depth and dimension. If pink is more your style, try these woven baskets from World Market. Use them to store anything from gloves and hats to papers and mail. Adding function and color to a space, these baskets are a great find! How adorable is this pink shag rag rug from Urban Outfitters? It would be a fun surprise to open a small bathroom and find this cute rug waiting for you. If pink and red aren’t really your color pallate, here are a few other Valentine’s Day inspired items. This ivory ruffle pillow from Pier 1 is fancy, yet playful. It would be romantic as a toss pillow in the bedroom, or a frilly accent in the living room. Set an intimate table for dinner with that special someone using this pink & purple tablecloth from Saffron Marigold. The Moroccan inspired medallion pattern and beautiful color palate are perfect for any date night. To complete the tablescape, fill a few of these pink & purple vases (from Henrietta Glass on Crescent Moon) with purple and white lisianthus. When I saw this Love Birds original painting from Once Upon a Paper on Etsy, it was love at first sight! The blue ‘leaves’ give a whimsical feel to the piece, while the two little red birds pop off the page to create the focal point. I hope you feel inspired by these home accents. Whether you are sharing Valentine’s Day with that special someone, a close friend, or a furry friend, I wish you a day filled with love! Andrew and I will be continuing our tradition of a delicious home-cooked meal, and hopefully a beautiful bouquet of flowers ;). º What Valentine’s Day decorations make their way into your home for the month of February? º What are your plans for Valentine’s Day? To complete the holiday wreath tutorials, here are the directions for the third and final wreath ~ the feather wreath. The feather wreath was the easiest of them all, but followed similar steps as the other two. The first step was the wrap the Styrofoam with the silver ribbon. I stapled the ribbon to the back of the wreath. Then, I wrapped the ribbon, and stapled it again once it was completely wrapped. I chose to do this step so that little glimpses of silver would show through the feathers. I then did the same thing with the feather boa (staple, wrap, staple). Once the boa was wrapped around the wreath, I found the perfect spot for the bird. He was easy to attach because he has a little clip on the bottom. I used a piece of silver yarn to hang the wreath from the window pane and voilà, it was complete! It was super easy, and I love the softness it adds to the mantel. By simply changing out the embellishment, I will also be able to use this wreath for other holidays. I hope everyone has a wonderful Christmas! º What gift are you most excited about giving this year? From my trio of wreaths, today I’ll be talking about the center wreath. To start, I stapled the ribbon to the back of the wreath. Then, I wrapped the ribbon around the wreath. I overlapped each strip about half-way. Here is a picture of the wreath partially wrapped. And here it is wrapped, but before I added the ornament embellishment. To add the ornament, I cut a piece of the ribbon so that I could attach the ornament to the smaller piece of ribbon and then add that whole piece to the wreath. I decided to sew the ornament to the piece of ribbon. Once the ornament was secure on the ribbon, I stapled the smaller ribbon strip to the wreath. That’s it! It was really simple, and it looks cuter than I hoped. To hang it from the window pane, I used a strand of silver yarn, but you could also use the same ribbon or a coordinating color ribbon. Different ribbon – patterns, plain, stripes, etc. – would give this type of wreath many different effects. One piece of advice too: the Styrofoam sheds, a lot, so be sure to do this project before you vacuum! º What ribbon would you use for this wreath? On a side note: º Has anyone seen any fun Christmas lights yet?